The seminars of Paweł Mościcki and Joanna Bednarek about the future and how to design it, Stanisław Ruksza’s and Jakub Gawkowski’s exhibition with the set designed by Michał Korchowiec, devoted to populism, unfulfilled promises and social disillusionments, workshop attempts to create solutions for the new education within the RePrezentacje programme, organised together with Theatre 21 The Centre of Inclusive Art: Downtown — these are the most important points of the autumn programme of Biennale Warszawa, which will be realised also in our new venue at Marszałkowska 34/50. We present the curatorial text with our programme as of autumn 2018. A year ago, when we were launching the operations of Biennale Warszawa, we announced that the main topic of our activities will be the future, understood as designing alternatives to current social, political and economics orders. The impulse to search for alternatives has become the expression of our critical attitude towards both the neoliberal vision of capitalism and identity projects in the narrow sense. We aimed and continue to aim at rethinking, discussing and proposing new, democratic solutions as an answer to a deep, structural crisis of capitalism, that would also constitute an alternative to right-wing ideologies which grow in power and importance. Those founded on a game of history, where the past is at the same time a point of reference, a propaganda tool and a kind of projection for the future. Furthermore, we want to go beyond the identity debate carried out in liberal circles, searching for other common ground topics around which we could build new alliances and communication. Our project of constructing positive alternatives for current political, social and economic orders is founded on a belief in the need to find profound democratic formulas, much more universal, much more equal and inclusive, than the current ones. We do not simply strive to correct liberal democracy, but we want to create a brand new project, taking into account much greater aspirations of citizens and their willingness to truly participate in political decision-making at the city, local, regional and international level. The specificity of an interdisciplinary institution, such as ours, enables us to think not only in the context of cultural projects and actions. It provides us with avenues to go outside and beyond established categories and divisions, and – at least partially – a chance to reclaim agency. We don’t believe that operating only within the space of culture would ever enable making social or political changes. Such an understanding of the social mission of a cultural institution would not even allow for changes within the culture itself. Therefore, instead of occupying ourselves exclusively with culture, we want to tackle broadly understood designing of institutions and initiatives, and shaping the political and social reality. The past year was a test of our capabilities and an introduction to the first Biennale in May and June 2019 – an interdisciplinary event, gathering all threads and topics we dealt with in the previous year and which we will tackle in the coming season. We devoted the previous season to new forms of direct democracy, projects of self-organisation and self-governance, identification and analysis of new forms of violence related to globalization and right-wing populisms, modern slavery and the future of employment, as well as city as the space of emerging new socio-political and economic orders; the city as the lab of the future. These threads will be continued, while paying much more attention to designing and testing positive alternatives. To a smaller extent, we want to use for this purpose critical strategies and languages, revealing various mechanisms of power, deconstructing collective mythologies, while to a much larger degree we will be wondering about the world in which we want to live, what relationships we want to create, how to make decisions and positively respond to major challenges of the present and the future. To ensure the stability of visions and ideas for the future, we need new institutions and new forms of institutionalisation. Thanks to them, we will move from the field of reflexion into the space of real action and change. This is why during the Biennale we will devote much attention to designing and subsequently creating them, forming visions and missions for new institutions, their rules of operation, legal forms, democratic organisational structures, and constructing their spatial and architectural dimension. By no means do we abandon the critical language. We treat is as an important element sensitizing to new power relations that might emerge as a result of our activities, a way to determine our position in the world and its circumstances, an important tool for shaping the reflection on the vision of change, a way to correct our ideas and projects. However, after analysing deficits in the public debate and socio-political life, we do believe that it is nowadays necessary to move from critical reflection to speculation, and then positive interventions and design work. The complex analysis of the situation itself won’t make the future more human. Our programme will include projects where the critical perspective will be the dominant one. 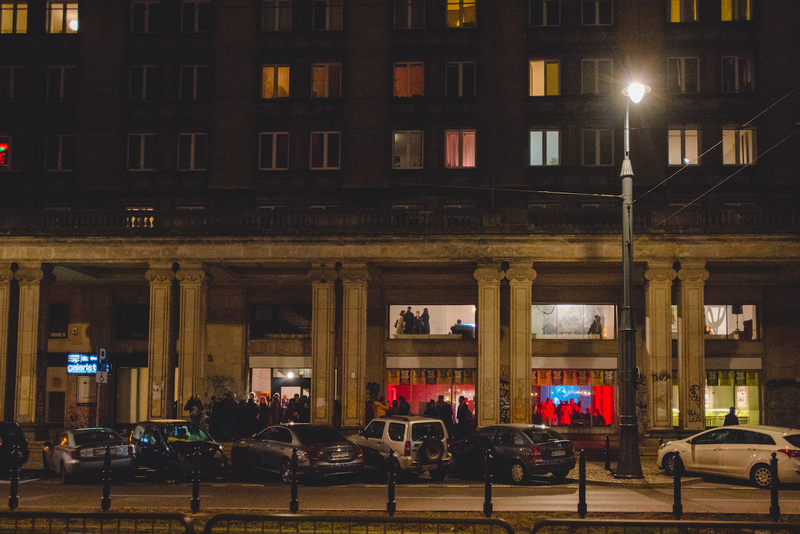 The exhibition “SKIP THE LINE!”, curated by Stanisław Ruksza and Jakub Gawkowski, will be devoted to populism and various forms of impossible to fulfil promises that people fall for, just to experience bitterness, disappointment and disillusionment when confronted with the principle of reality. It constitutes the continuation of critical programming lines launched in the previous season. It will be closely thematically related to the lecture presented by Jonas Staal entitled “The art of propaganda that creates our world” (13 September 2018, 19.00, Biennale Warszawa / Mokotowska 29A). It will explain how the new art of propaganda works – from the international alt-right movement, to popular culture, to revolutionary art from Rojava, to activities of the speaker himself – which practices propaganda employs and how it shapes our reality. With Paweł Mościcki’s series “What awaits us? A film seminar about images of the future” (start: 11 September 2018, Biennale Warszawa / Mokotowska 29A), we definitely enter the field of speculation and designing the future. Even though the starting point are catastrophic and apocalyptic visions of the future connected to climate change – exhausting natural resources, rapid rise in temperature, shrinking living space, as well as related global conflicts and tensions at an as yet unprecedented scale – the anticipated thought horizon is finding the way to oppose these unwanted scenarios. In this series, there is no easy optimism associated with the omnipresent innovation culture. It was, after all, founded on the assumption that only the confrontation with the dark vision of the future can motivate us to develop radical solutions in the present. We will be searching for hints, traces of the future and its potential shapes in popular cinema. During Joanna Bednarek’s seminar “Future is monstrous: speculative fiction, Anthropocene and the end of nature” (start: 23 October 2018, Biennale Warszawa / Mokotowska 29A), we will take a closer look at scenarios of the future inscribed in fantasy fiction: visions of future societies, various and often odd models of the future, possible worlds and alternatives to the current system. According to the author, we won’t be able to effectively face the challenges of the future without changing the way we think about the human being and nature. For this purpose, we will direct our attention to mysterious, strange narratives from the new weird genre, which should help us to expand the limits of our social imagination and rethink what today seems improbable. After summer workshops in the Centre for Foreigners in Targówek Fabryczny (GRAWITACJA / Kaya Kołodziejczyk & Teresa Otulak), Bemowo (Stwórz TO z SIKSĄ. 10 dni gniewu i miłości / Siksa) and Białołęka (Korczak / Anna Smolar, Michał Buszewicz, Dominika Korzeniecka, Hanna Maciąg, Rafał Paradowski) we continue the RePrezentacje series, this season devoted to creating solutions, programmes, ideas and models for the new education. “Children deserve an essential place in the human hyper-parliament,” wrote Agata Siwiak, programme curator. The culmination of many months of working with children and youth will take the form of a design for the new model of institution for common welfare, which will be created together by workshop participants in cooperation with Maciej Siuda and Agata Kiedrowicz. We will be able to see its material manifestation during the Biennale in late May and early June 2019. Together with Theatre 21 Foundation, we are initiating the programme “Disability and Society” which is to result in the creation of a permanent place for artists with disabilities to create in the Warsaw Centre of Inclusive Art: Downtown. It will also be a model of a new interdisciplinary institution which – around subjects connected to disability – will combine the areas of culture, activism, theory and education. First lectures and workshop activities (The Architecture of relation, Freak Show) begin as early as September. The play “Revolution that did not happen”, directed by Justyna Sobczyk, will premiere in December 2018. In mid-October, we will hold the finale of the short comics competition White Mirror 2118. Its objective is to stimulate the utopian imagination designing the world of a better future. The point is not necessarily the perfect idyll, but the reality which in important aspects is better than the one we live in today. This is why we confront the eponymous black mirror from the popular TV show with a White Mirror – an artistic vision which will reflect the future better than the present. We are particularly interested in three dimensions of the human world: economy, technology and natural environment which is less and less given, and more and more manufactured by ourselves. We also deliberately face the challenge of positive design-utopian thinking which is much more difficult than dystopian thinking. But it does constitute an indispensable element of the effort to prepare progressive scenarios of the future. In this regard, culture and art can be the perfect lab for creating forms and solutions which will perhaps exist beyond them. Similarly to Paweł Mościcki’s film seminar, the comics competition is an event accompanying the conference “Cultures of the anticipated futures” which we organise in cooperation with the Institute of Polish Culture, University of Warsaw. We want to take this opportunity to try and overcome pessimistic diagnoses and the sense of impending ecological, economic, political and technological catastrophe. It can also serve as an exercise in anticipatory imagination, where the future has a range of diverse meanings – as a category of thinking and as a notion. An important point of reference for our reflection on the future is its performative dimension, related to agency and effective action in a complex social reality, also through imagined ideas. If Franco Berardi – a guest invited for the conference – is right in stating that opportunities lie in the social mind, social organisation of knowledge and in cooperation between knowledge workers across the world, then we should ask a question about political strategies of engaging the future, both at the global and local level. Yet another element of the practical deliberation on the future will be a series of events concerning design, we organise together with Warsaw Design LAB and the SWPS School of Form. It will include meetings with designers and theoreticians of design developing alternative visions of what, in future, the human being, humanity and natural environment could become. This is a topic which has an important place within the current called speculative design. We will invite designers working on, among other ideas, digital countries, human genome or shaping the forces of nature. But our focus won’t be on making abstract conjectures, but on concrete solutions which often already have practical implementation. The next edition of the international, interdisciplinary Biennale – which will be held in May and June – will be devoted to the topic of designing the future. We are planning to abandon not only dystopian, catastrophic and apocalyptic visions (not forgetting important critical lessons which they teach). We don’t want to take a naively optimistic attitude either, and think about the Future with a capital F. A future that can be predicted by identifying its key trends, and distinguishing, in the present, “weak signals” that can be boosted. We are also thinking about designing the future as problem solving and implementing innovations. This model of action – typical for certain design currents – usually focuses on the short-term perspective, without considering broader, systemic conditions as well as the necessity for more profound changes of our values, beliefs or behaviours. Both attitudes towards the future instrumentalise it, attempt to pin it down and master it. But how, without instrumentalising the future and limiting ourselves to only predicting trends, can we achieve agency in shaping and designing the future? How can we give it material and non-material form, design particular political, social, economic and ecological solutions and real institutions which can become vehicles for ideas, reflection, vision and speculation? Our programme envisages reaching for artistic (performance art, visual arts, music) as well as legal, political and activist tools, speculative design, social and ecological design, humanist economy, sci-fi literature… We will be designing new institutions of the future, speculating about that future, exploring various hypothetical scenarios, drafting new models, testing alternatives to current orders, using thought provocations and creating fictional worlds. We want to explore what is possible in the future not based on the current cartography of the social imagination, but in the situation of a new logic of this imagination’s expanded horizons. The scale of these activities is important: we are interested in both what is below the national state (the city) and above (transnational and translocal relations); both designing what is natural, what is closely related to the idea of the city as the lab of the future, and laying foundations for new transnational relations, in which we will focus on what is shared, opening up the field for the new universalism, while abandoning national identities. The objective of all these activities is designing institutions, initiatives and solutions in the social and political field which will translate into the vision of a better, more human, fair, democratic and equal future.